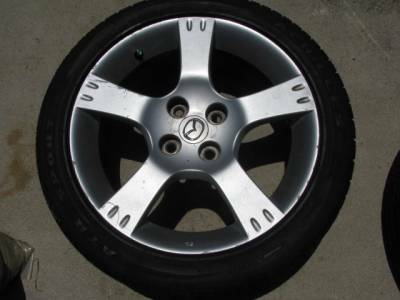 Description: '03 Miata LS Wheel, good condition, minor curbing as shown in close ups. 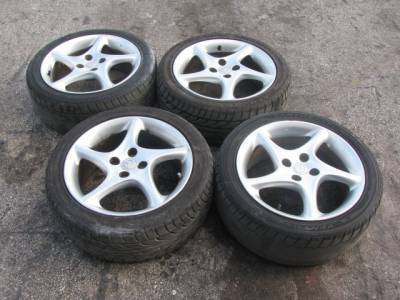 Tires in good condition and are free. We will remove it if you want to reduce shipping costs. Inquire if you want both wheels. 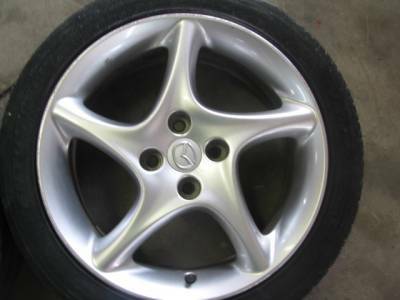 Description: 14" by 6" 5 Spoke aluminum wheel in good condition. 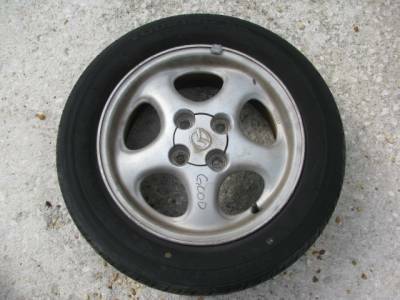 We will remove the tire to reduce shipping cost. 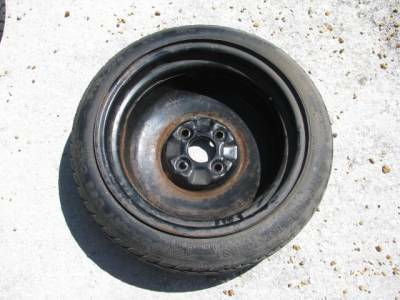 Description: Spare Tire in good condition. Description: 14" by 5.5" aluminum daisy wheel. We will remove the tire to reduce shipping cost. Shipping charged separately. Shipping charged separately. Generally it is $15 to $25 per wheel. 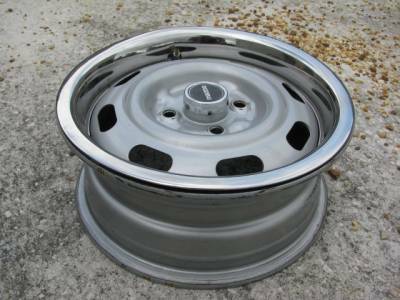 Description: 14" by 6" 7 spoke aluminum wheel. 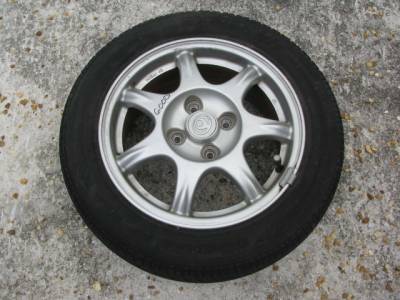 3 types available, please compare your wheel with pictures provided and select the correct wheel type. 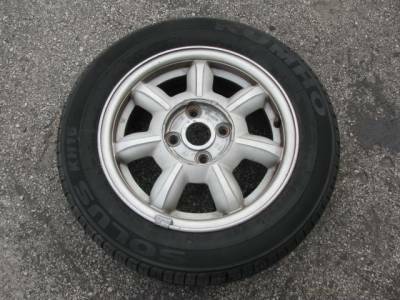 We will remove the tire to reduce shipping cost. Limited availability, wheel inventory is constantly changing. Please inquire with us before placing order. 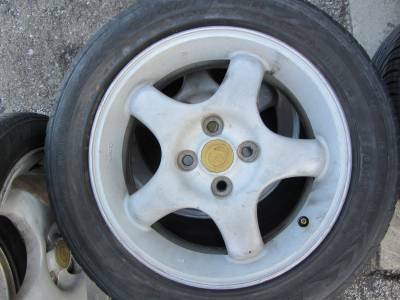 Description: 15" by 6" Aluminum 5 Spoke Wheel in good condition. Please send zip code to TreasureCoastMiata@att.net for a shipping estimate. 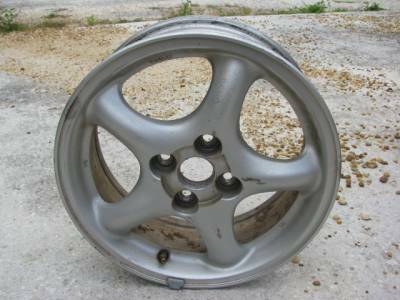 Description: 16" by 6.5" Twisted Spoke aluminum wheel. We will remove the tire to reduce shipping cost. Typically these wheels exhibit some paint bubbling, even down here in Florida. We will send the best one we have. Pictures will be sent on request.